Nirmalangshu Chakraborty was UGC research fellow at Assam University, Silchar, India. 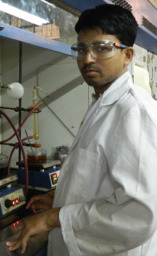 He completed his Ph D programme with Prof Nandiraju V S Rao, Department of Chemistry, Assam University, Silchar, India related to the design, synthesis and characterization of achiral four-ring bent-core compounds and influence of substituents on the mesomorphism of these four ring compounds and to study their optical properties. Dr Chakraborty visited Tokyo Institute of Technology, Tokyo, Japan as Research Fellow under Global COE programme of Education and Research Centre for Material Innovation and advanced studies related to chirality in achiral liquid crystals and optical characteristics in novel nematic phases under the guidance of Prof. Ken Ishikawa and Prof. Hideo Takezoe in the Department of Organic and Polymeric Materials, Tokyo Institute of Technology, Japan. He worked as post doctoral fellow with Prof. N Jayaraman in the Department of Organic Chemistry, Indian Institute of Science, Bangalore, India in the field of dendrimer liquid crystals and nano objects coming from dendromesogens. His research interest lies in the synthesis and studies of electric-field responsive liquid crystals, chiral nematic liquid crystals, polarization modulated B7 phases for the design of electro-optical materials. The image is of a four-ring bent core compound which resembles fingerprint texture of stripes in focal conic fans similar to that found in homeotropic (freely suspended film) B7 preparations which was taken in uncovered free-drop droplets in B7 phase. These optical textures are found to grow through a process of nucleation, growth and coalescence over a period of time of few hours depending on the thickness of the sample. 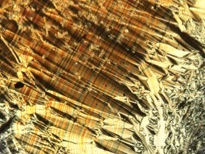 The picture was taken at 131C on Nikon Polarizing microscope attached with Instec STC 200 hot stage and Nikon Digital sight DS-Fi1 digital camera. The image dimension is 1280 X 960 (Width 1280 pixels and Height 960 pixels). Jury comment: This month, July, the 25th ILCC is held on Dublin, Ireland. The featured picture is chosen because the pattern is similar to the Irish dancing dress pattern. Hope that everyone can join the conference this year.